Law enforcement is taking a new approach to working with individuals with heroin/opioid addiction and mental illness. Across the country, more law enforcement agencies are partnering with treatment organizations to get people the help they need, rather than throwing them in jail. Addiction-related offenses take a significant amount of law enforcement time and resources. It’s typical for a police officer to be called to the scene when someone overdoses, and then the individual often need to be hospitalized. The officer must then stay with them until the individual is discharged, which could be over 12 hours. After this, it’s typical for the individual to enter a cycle of arrests related to their addiction. For many local communities, this means jails are crowded with repeat offenders. This has led many in law enforcement to recognize that arresting these individuals is not addressing the root of the problem. Jail isn’t helping anyone recover from their addiction and/or mental illness. This is what sparked the launch of Certified Community Behavioral Health Clinics (CCBHCs) in eight states in 2017. Many law enforcement officials began partnering with these CCBHCs to connect addicted offenders with health services instead of jail time, addiction treatment in jail, and ongoing care after release for people with mental illnesses such as opioid addiction. As a result these states have seen less recidivism and overcrowding, and have connected more individuals with essential medication-assisted treatment (MAT). Police officers are also using technology to connect those with opioid addiction to the resources they need. In Springfield, Mo., officers use a tablet to help those with mental health emergencies speak with a CCBHC clinician. In 2017, none of the individuals who chose this option were incarcerated, only 13 percent needed to be taken for inpatient psychiatric care, and 84 percent avoided hospital emergency rooms. Before this technological option, these individuals would have been taken to the emergency room or jail, where 85 percent of inmates have either a mental health or substance use disorder. In Niagara County, N.Y., they have also seen a reduction in recidivism due to a CCBHC partnership with law enforcement. In this community, addiction contributed to 70 percent of the offenses that led to incarceration, which pointed to a clear need to help this population. These law enforcement officers work with a CCBHC-staffed mobile unit with a counselor, peer support specialist, and access to telemedicine services, which meets inmates at the door upon release. They will screen and assess their needs, then provide transportation to their first MAT appointment. This addresses one of the major obstacles to providing these individuals with the care they need: getting to their first appointment. The success of this effort has inspired a similar program in Shepherdsville, Ky., with 24/7 crisis care for addiction and recovery. This community has suffered from a particularly high rate of opioid abuse, and the hope is that this effort will provide the change needed to address the opioid epidemic. Beyond the CCBHCs, other treatment organizations are partnering with law enforcement for heroin and opioid prevention. The Police Assisted Addiction and Recovery Initiative (PAARI) has partnered with law enforcement agencies across 28 states to help create paths to treatment for those who commit addiction-related offenses. Their mission is to create more non-arrest interventions for these individuals to increase access to treatment, improve public safety, reduce crime, ease the burden on the criminal justice system, and increase trust between law enforcement and their communities. Most recently, PAARI partnered with the Massachusetts Environmental Police to train police officers in recognizing and responding to an opioid overdose and how to administer naloxone, a medication for opioid overdoses. Officers will now carry doses of this life-saving drug, as well as contact cards for recovery coaches who can be found across Massachusetts. This is the first conservation law enforcement agency to join PAARI. Recently, a woman named Courtney Nunnally began partnering with Richmond police officers to help substance users find recovery. Nunnally suffered from opioid addiction herself, but has spent the last six years sober, and has made it her mission to help others recover from addiction. Currently, she volunteers with the Chesterfield jail to help inmates with heroin addiction to find hope. She is also a peer recovery specialist who rides along with police officers to talk to people with substance abuse problems about how to get help. In addition, she acts as a liaison between the police and Recovery Unplugged, a drug addiction treatment center. Now, she has started her own nonprofit organization: Addiction Uncuffed. Through her organization, she rides along with police officers to connect with heroin addicts to help enroll them in treatment programs. 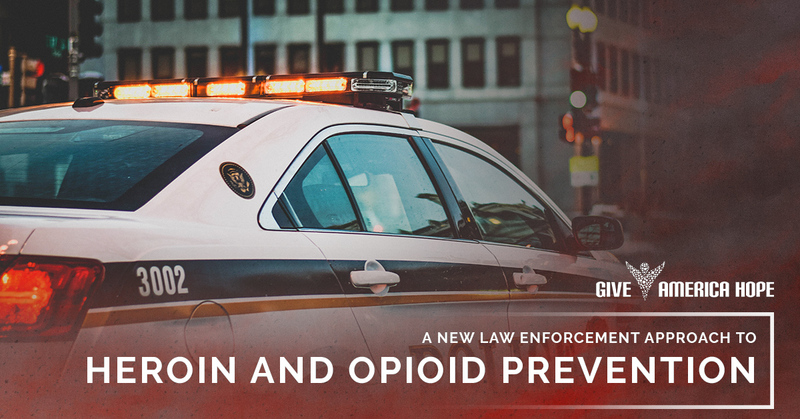 Law enforcement is in a unique position to help fight heroin and opioid addiction, and these partnerships with treatment organizations have already begun to make progress. To learn more about how you can help with heroin and opioid prevention, visit Give America HOPE.